It should be pointed out that not all users will see the Payments option in their WhatsApp. However, the feature gets activated after someone with Payments feature live for them messages the user. After receiving a message, the other user should relaunch the app and Payments will reflect in WhatsApp’s settings. In our case, Payments is now working on iOS after we tried this method. WhatsApp was so far conducting beta-testing for the Payments feature on the Android version of the app. However, it looks like the feature is now being rolled out to both iOS and Android, though as already noted above it will not be visible for everyone immediately. Payments on WhatsApp will appear in settings. It will rely on India’s UPI to allow for direct bank transfers. WhatsApp appears to have partnered with ICICI Bank for facilitating UPI payments. Users will have to accept the terms and conditions and verify their mobile number again via SMS to activate UPI. The list of Banks supported on UPI is fairly comprehensive. Popular banks like HDFC, Axis, ICICI, SBI, Yes Bank, Allahabad Bank, Punjab National Bank, etc all are on the list. WhatsApp Payments feature: Here’s how it will look on the iOS version of the app. Go to Payments in WhatsApp> Settings. Once here, you will have to add a bank account. Tap on add new Bank account. WhatsApp will then ask you accept its terms and conditions. Once you have accepted, you will be asked to verify your number. UPI works by checking the mobile number with which your bank account is linked. So make sure the mobile phone has the SIM for the same mobile number. This mobile number should be the same for your WhatsApp account as well. Once the mobile number has been verified, the list of banks supported will appear. Choose the bank with which you have an account and where UPI is activated. The Bank account details should appear with the last four digits of the account being reflected. Choose the bank account which you wish to add to UPI on WhatApp. The users will then need to enter the last six digits of their debit card number along with the expiry details to create a Virtual Payee Address (VPA). Now to send money, go to a chat with any person, even in a group chat. Tap on the + symbol for attachments and you will see Payments. If the other person has Payments enabled, the feature will work. In a group chat users can choose an individual member of the group to whom they wish to send the money. If the other user does not have WhatsApp Payments, the app will alert you of the same. The other user will need to activate Payments as well. 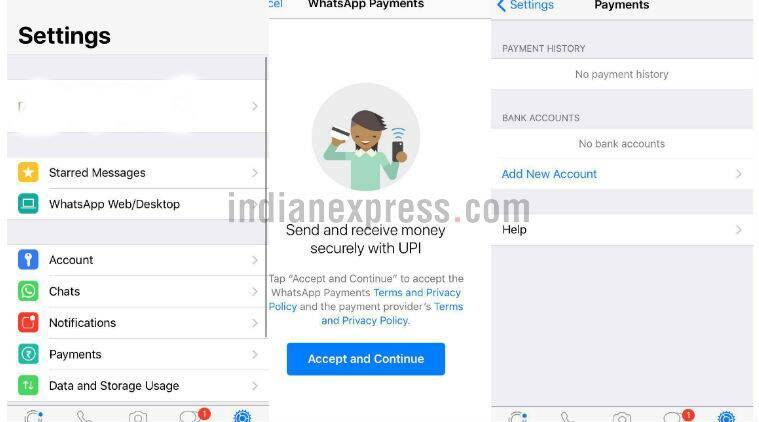 WhatsApp UPI-based payment makes it easier for users in India to send and receive money through one of the largest messaging apps in the world. WhatsApp has about 1.5 billion monthly active users globally, out of which 200 million are in India. The service is available in 10 Indian languages.